Earlier this month, Ministry of Testing released an article named “The One Page Test Plan“. Presented, was rather a one page template for a test plan yet the article is good and thought provoking. Coincidentally, a similar question came up on Quora: “How would you define a test plan for this app?“. So I went to see if I can give a version of “one page test plan”. Cross-posting my answer from Quora. Before I go ahead, I’d like to point to a few potential “traps” in the assignment. They might be intentional or due to some other reasons. Requirement to prescribe all needed tests while good testing always involves learning from your test results. No collaboration and / or communication is allowed. In my book I separate strategic and tactical plans. A strategic plan would be something at a product level, broad and systematic, responsive to change, considering product value and risks, stating designated performers (aka “resources”), schedule, and logistics. A tactical plan would be something responding to an immediate mission, something short-term and rather lightweight – better spend more time acting than planning. 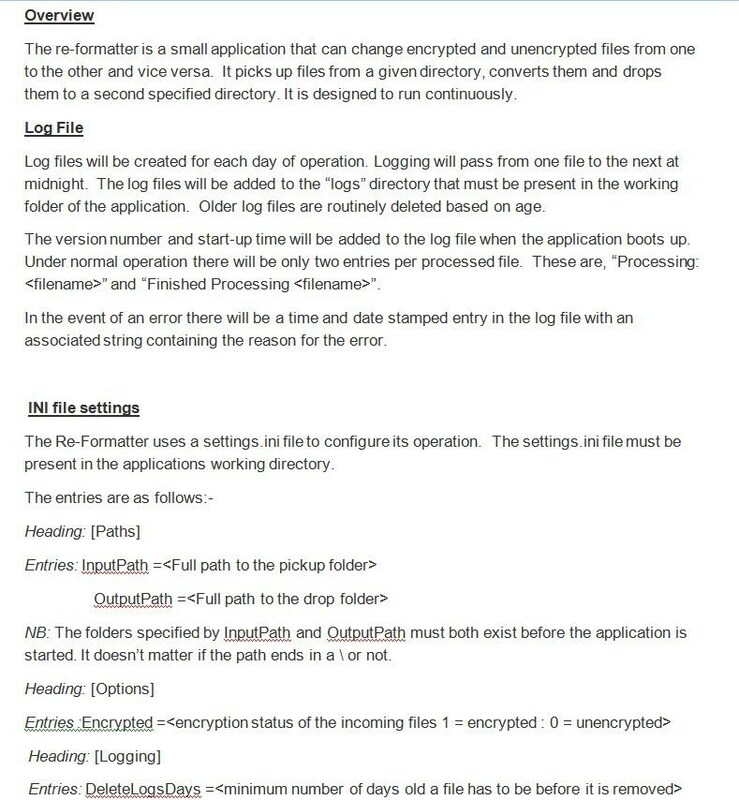 Both plans may contain technical details like environment, database, etc. and administrative details like sign-offs, exit criteria, etc. All those are company specific. Considering these details – it needs to be brief and informal; roughly around 30 minutes – my answer goes with a tactical plan. Let me first say that I’d probably fail the assignment :) – I don’t think I could outline both tactics and all test ideas in 30 minutes. I already haven’t. It took me about an hour and a half to put the stuff together, not counting additional time for explanations. For tactical testing missions like this one I developed a “SWOT” approach. I combine taking notes on what I’m learning about product and mission with my test ideas, questions, concerns, and so on. I may hand scribe the notes or use tools like mind maps. 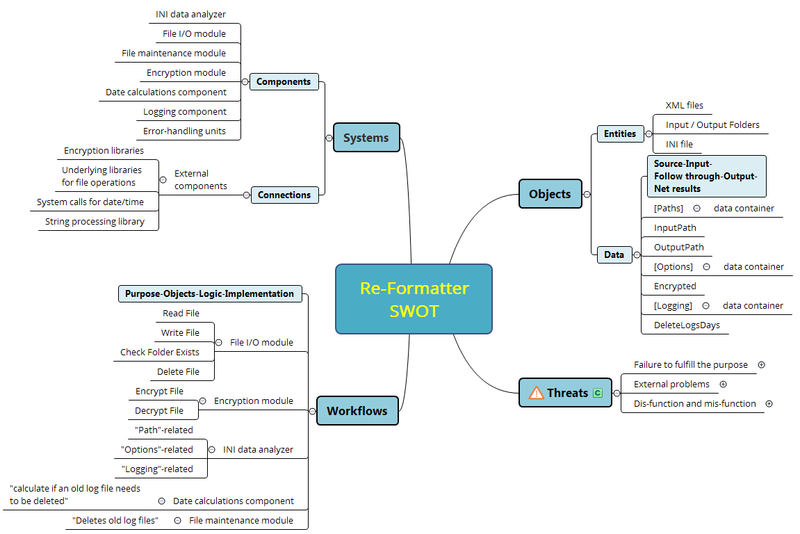 On the mind map below you can see SWOT structure, corresponding to Systems, Workflows, Objects, and Threats. These are all intertwined; different categories represent looking from different perspectives. It took me about 20 minutes to map this initial SWOT, excluding the Threats node. This is not a complete map nor it pretends to be completely accurate – this is however the milestone of my learning. While executing the plan I also take time to critically reassess my initial conclusions (test your testing!). Then I proceeded identifying risks and points of interest under Threats node. These are potential problems that may threaten the success although the definition of success is not known here. Neither is the purpose, which only increases the risks. And this second map again would be a good thing to have a communication around. Based on the input from business and programmers I’d refine my list of risk categories, and I’d also have more information on how to prioritize them – that is, how deep, how broad, and in what order I will perform my tests. But, alas, one of the constrains of this particular assignment is that I’m deprived from communication, so I’m just going to enlist some of my test ideas. Again, this is not a complete list. Yes, I remember that the assignment requests to provide test plan for complete coverage :) It’s not uncommon. Often people make such requests only because they didn’t realize the nature of testing. Patiently helping them to understand is the key. 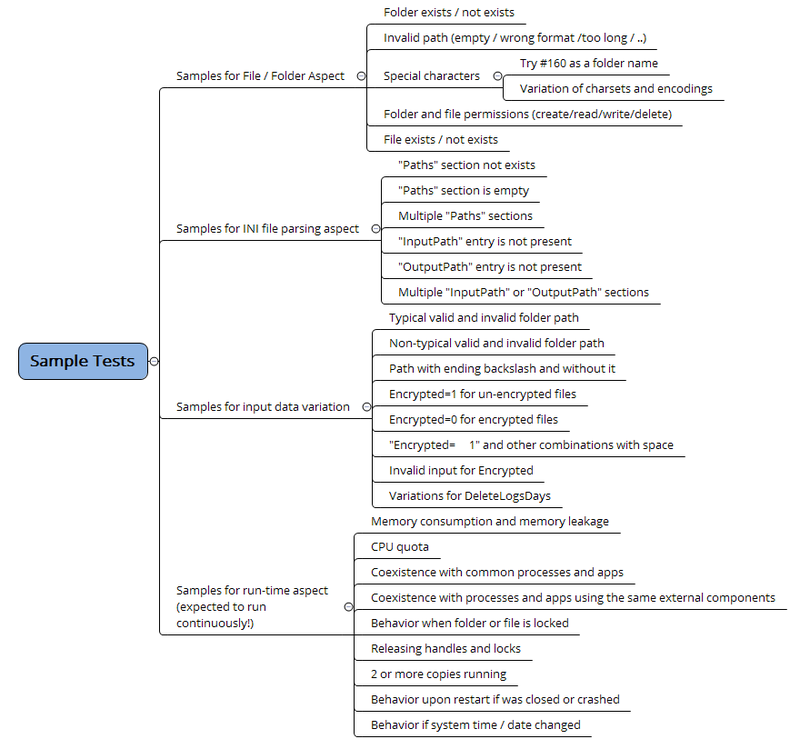 For example, I could start with showing my sample list of tests and outlining what are other aspects and categories. I would not refuse to test “completely” but would suggest to perform testing in certain order, corresponding to bigger damages and higher risks. I may even suggest to map the product’s components and features according to a risk matrix like below. This way my client and I will have a shared understanding on what are the top priorities and why, and also why certain areas may receive little or no testing, if there isn’t enough time. But, again, it requires communication and collaboration. But who says we can’t do that during the assignment?